And then my mom "tweeted" with the sad news that she had not seen one picture of Harper in days. How did this happen? Am I really in a blogging slump? So as soon as Harper woke up from her nap - we took these pictures and I couldn't decide which was my favorite so I just put them all on here. Today was the first day of school around here. I have enjoyed looking at pictures of all my friends and college friends and high school friends sending their kids off to school. I know that the next five years will go by in a flash and it will be me soon lining Harper in (hopefully) a cute dress and bow and making her pose for a picture before I drop her off and spend the rest of the day crying (or rejoicing - we'll see which one! ha!) For now we'll just enjoy the fact that she tried Squash last night and loved it! So let me hear from you - if you have kids - how was the first day???? Harper is so stinkin' precious! You are a wonderful mother! Harper is precious as always!!! No kids yet, but as the teacher of 27 nine year olds...the past week and a half have been a work in progress!!! They have already made tons of progress:) Hope ya'll are doing well!! I started my first day of homeschooling last week!!! Yikes!! So far so good though I is kind of nice to not have to argue with my ten yr old about what to wear! Kelly, your joy of being Harper's mommy shines through in each and every one of your posts!! When I started kindergarten, my mom gave me a little heart necklace of sterling silver, to remind me that she loved me. I have worn that necklace every first day of school all the way through college and for big events when I need a little courage or reminder that I am loved :) Just an idea for your little Harper someday. I plan on passing it on if I get a little daughter someday. I've been reading for months and this is my first comment to you. First, may God bless you for your witnessing. You make us all want to be better Christians! My son is 17 mo. old today! Tomorrow is our first day of school...to The Little Gym! It's like "baby tumbling". I think I'm more excited than my little Trey is!!! Harper is going to be possibly the cutest kindergartener. And, the girl with the bow! (: My school starts September 3rd! THANK YOU........THANK YOU VERY MUCH!!!!! I don't have children yet, but I am a teacher and it was my first day with students (4th grade)! It's always exciting meeting the new students, but I'm sure when I have children I'll be sad when they go to school! There's always something to blog about with Harper around! kids aren't in school yet, but I dread the day. A coworker had her FIVE year old start preschool Monday and they LOST her child. She got on the wrong bus and never made it to daycare. She went to pick her up at 3:30 and she wasn't there. School didn't know which bus she got on and she 'lost' her for TWO hours. I would DIE. FREAK. DIE. So cute! I love the upholstery on your chair!!!!! I didn't cry when Aaron went to preschool (public school) on Monday. I was very excited for him because he was so bored with the lack of activity at day care. He has really enjoyed all the things he has done so far this week...except he didn't care too much for finger painting. First day of school! I have been in school for a month now, teaching my little first graders! Enjoy your precious time with your little one. . . You blink and it is gone. My kids go to Elm Tree and they started 2 weeks ago but I just found out that I am the Homeroom Mom! My oldest started kindergarten today. I cannot believe it. The time has truly flown by. Her little sister kept wandering around the house looking for her...it made my heart hurt. She was all smiles when we picked her up and said she had, "the greatest day". Harper is PRECIOUS as always! her hair is really growing! she's adorable. My son started Kindergarten last Thursday and did great. In fact he asked me why I was still thier :( of course lots of pictures and I even video taped the ride there (we only live 2 blocks away..ha ha)but I will be glad for that video when his older. Enjoy your beautiful girl...they grow up to fast. I am pretty sure my son loves your little girl! Every time I have your blogged pulled up he say's "baby!" and blows her a kiss! Who needs something to talk about when you can just post pictures of that little cutie! Adorable! We have actually been in school for almost 3 weeks (tomorrow) but this year is the first year that I did not have MY daughter at the same school where I teach. Gone were the primary years of pretty dresses and matching hairbows with me taking her pictures. Hello to the zebra print shirt with capri pants and Hannah Montana book bag. Enjoy the hairbows while you can get away with it! Will's first day was last week and he did wonderful. It was harder on me then him. I officially have a kindergartener now and it completely 100% terrifies me!!! Well, feel free to update my blog for me! I'm way behind and I'm back to trying to post every day. With my hubby deployed, I thought he'd enjoy seeing the kids activities. Today was our first day of school. I was more nervous for my 2nd grader than he was apparently...though last night he was really nervous! He had a great day which makes my day a great one! First day of school in TX hasn't started yet, it starts Monday. I am sending my second of three off next week and I am just a mess!! Somehow I feel it's going to be harder on me than her, even the second time around!! I'm in VA and we don't start 'til Sept 8th. But the time is flying by. My first born will start Kindergarten. I'm sure there will be lots of tears--but from me, not her! She can't wait! My oldest child started kindergarten today. Here is my blog about it. OMGosh! Is it just me or does Harper's hair really seem to be coming in?! SO cute! It looks blonde! My one and only baby starts Prek-4 tomorrow and I've been crying for a week! Today we had our last "Mother/Daughter Hurrah" (shopping and lunch) and then she let me hold her during the Hannah Montana movie. Good times! She gets cuter and cuter every day! My girls have been back in school for 3 weeks now and we are all loving it. They love the routine of school and I'm loving the normalcy that school seems to bring to our household. My little guy won't start preschool until Sept. 1st - then all my babies will be in school. Harper is just as cute as ever! And yeah for her liking squash. I wish I could get my kids to eat squash again. Ummm.. I only see one picture of Harper at the very top? She is getting more and more hair! too cute!! I work at a major University and almost 6,000 freshman descended upon us this week. Monday starts classes for everyone and the insanity begins! We live here in NW AR and attend school in Springdale. We have 3 girls and my middle girl started Kindergarten today. I immediately ran home and blogged all about it for the grandparents! No tears today and I hope they stay away because once they start, I might join in! I cannot believe how time has flown by; sweet Harper will be there before you know it! Oh my goodness, the second picture is my favorite. She is so adorable. You blogged the best thing ever, Miss Harper! You are an inspiration to me and I love your blog. We home school and began 2nd grade 3 weeks ago so we can finish a semester before moving to Germany (we really thought we were going to Little Rock!). It's been fun and a bit of a logistical challenge since our youngest is now very mobile! Funny thing is my post yesterday was titled: Blogging Blunders... in other words telling everyone I have nothing to blog about to help me with any ideas. Glad I am not alone. I also have pics. up of sending my now 2nd grader off to school, and riding the bus for the first time. As usual Harper is a doll, even right up from her nap. Love her with a pacy in her mouth. My girls started back to school today, we live in Fort Collins, CO. Peyton started 4th grade and Olivia started 1st, this is so hard to believe. They both had great days and look forward to tomorrow. Well, at least Peyton does. She's my nerd :). I hope to get some pics up on my blog tonight. Our homeschooling year started on Monday. So far, so good. I've got a post up about it. 6th & 3rd grades - YIKES. It sure gets here fast. Enjoy the days when you can dress Harper in pink and ruffles and dresses and bows in her hair. My daughter is 7, and for the past year she has resisted all of the above. It goes sooooo fast! Well. . . .I sent my baby girl to kindergarten last week and it was a hard, emotional day. Luckily she was all about it and very excited, I was the only teary eyed one in the house that day!! 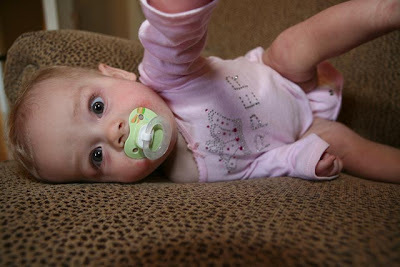 I ♥ all the pic's of Harper, she's a doll! Well my little one is only a month old but I look forward to when we start preschool un a few years. We're going to homeschool so I'm so glad I won't have to send him off. I couldn't help but notice how much more hair Harper has. Oh my....she is gorgeous. I still have one week to prepare myself. My oldest starts high school...9th grade...oh my! And my baby starts 1st grade...all day (unlike her 1/2 day kindergarten)...oh my again. I already get a lump in my throat when I think about it. Boy, this is going to take some getting used to. Oh...and don't worry about the shower...as long as I get it in before hubby comes home from work I call it productive. Just helped my youngest daughter pack her car to move back to college...she will be a junior. I have only shed a couple of tears today...which is pretty good compared to two years ago...I cried a little every day until the end of October!! Enjoy your babies while they are home!! She is showing some sass!! I know what you mean by time just flying by. How will you ever pick a first day of school outfit!?! 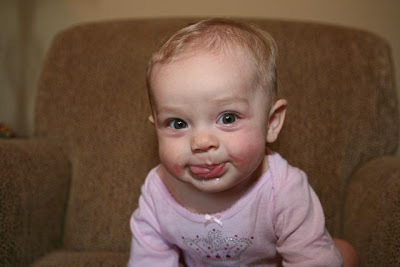 My favorite pic is the one where she's blowing a raspberry... so cute! We all have those days when we have nothing to blog about... but some of the best posts are the ones that include our everyday happenings. I use our blog as our journal and try to post everyday. Of course I love to document the days that we just bake snickerdoodles or make a yummy dinner together, or Owen gets a balloon at the grocery store. It's the little memories that are SO fun to look back on. I loved this post. The first day of school was wonderful as always. Kamryn is in fourth grade and I still drop her off and pick her up every single day. It's so fun to volunteer in her class and help plan class parties. You'll LOVE it!!! Harper-girl. They are win for being the cutest! Harper is so cute!!! Our kids don't start until next Wednesday but there's already excitement in the air around here! Cute pics!!! I cried three times today thinking about Connor going NEXT year!!! So much for those hormones getting under control- ha! Oh the first day! I sent my first daughter to her first day of kindergarten today...so bittersweet. Check out the blog for all the details! The second picture is my favorite!!! Although, they are all cute. But I have to say that of all the big popular blogs yours is my favorite! Little Harper is just so adorable,...and you are so warm and so real. I like to come and check on you and see how things are going. May God continue to richly bless you sweet lady. My friend took me to lunch and out for ice cream and then my husband took me to a movie. So now I am catchimg up on my blog friends and facebook friends. I had lots of Birthday Wishes from both, so I am feeling kinda special. God is so good isn't He? Harper is such a little cutie! I have followed your blog for about 3 months now and I am enjoying everyone of your posts! Keep it up, you are such a blessing! What is up with these schools everywhere but here in Georgia starting so much later. I am so jealous. I am a first grade teacher and the kids started August 7th!! And I am sure that when you send Harper off that there might be a few tears... :) It's normal! $ more days for us here in Sugar Land,TX..Just 4 more days. I can make it before i loose my mind..( (mine are 6 and 7 and 11 months apart..yep I am nuts.not my plan G-d's plan there) I hope. LOL..Seriously Harper is so cute! I really enjoy reading your blog. Thanks for letting me be apart of it. Adorable pictures of Harper. I don't have children,but I teach and today was my first day with the kids. I can't believe how tired I am! We had one mom crying in the second grade hallway. Mine are still too little for school! I have a feeling I'll be in the rejoicing crowd when they do start though :) Great pictures of Harper! My oldest started kdg last week. She was born on the cutoff date in our state and would have either been the oldest or youngest in her class. As a former kdg teacher, I knew that she was ready in so many ways last year but waiting would give her a chance to mature and be even more ready. I am SOO glad we waited to start her...the confidence is easily seen and heard. Also, a word to those who think preschool is "necessary" - my daughter had several outside activities and classes the first 6 years of her life but not a SINGLE day of preschool. She was reading several months ago, tying her shoes, and doing many other things that kdg teachers usually only dream of this early in the year! If you are a SAHM, consider that these days will not return to you once they are gone; the closest you will get is if you choose to homeschool. Most moms are better teachers than they give themselves credit for being - especially since preschoolers learn by simply playing, observing and experiencing. I am so thankful for the time DD had at home with her brother since his birth in 2007. Again, it is a season not to ever be repeated again. Harper is too cute! You sound like one of the best realistic mothers!! I start High School on the 8th and am so very excited and nervous! Oh my land, Harper is so very cute in those pictures! Good for you to just enjoy a down day at home with each other. Very fun and it seems you are enjoying every second! My three kids started 8th grade, 6th grade, and 3rd grade on Monday. All in public schools this year and two of the three are starting in two new schools this year, so we have spent these last three days (school started Monday) praying lots, being faithful to help with homework, siging mounds of permission slips and paper work, etc. My middle school daughter left a few really nice Christian friends at her last school, which is tough for girls, so it has been a bit emotional, so we keep clinging to God and asking him to provide as she steps out in faith at her new school. God will provide again! Last night she came home saying she wanted to reach out to a new girl at her middle school that is blind and has some other special needs, so today she came home to tell us how God led her to sit with her at lunch and get to know her. God helped her ask the right questions and get to know her and it is neat to see that in a public middle school, where many of the girls are worried about image, popularity, etc. God has so many treasures like that for us, if we just stay sensitive and obedient to Him, so we are very proud of our Hannah and praise God for how he is at work in her life. The kids are adjusting to new schedules, a tough cross-country schedule, new friends, and much more, but God is meeting us in the midst of all of it! It is hard at times for me to surrender my kids and literally feel like I am laying them at his feet, but the surrendering is a good place to be, I guess. Thanks for asking Kelly! Bless you and enjoy baby Harper. One of my kids, turned 12 this week and I don't know where the time has gone, but we are embracing this season we are in right now, at the same time I sometimes really miss those precious baby days! Harper is so precious! I love that chair! Our first day of schools have always been harder on me. Our first son cried and I missed him terribly. Our second (a daughter) practically ran out of the car thrilled to be free, I cried. Our 3rd (son) was okay with going and would have been okay with staying home- he could have gone either way I cried all day- again. Our 4th is 9 years younger than the youngest and she cried and held on to me and sobbed and begged me to take her home and said how she would miss me... I cried, she cried... it was terrible. I cried all day. So for 3 weeks now, we have both cried every day until today- she finally went to school with dry eyes... Thank God, I have been seriously praying for her to have peace. The first day of school can be so hard, but I think it's also a good thing as they learn to trust others, be social and make life long friends! I hope your still blogging when Harper starts school I can't wait to see what she'll wear! As always, thanks for blogging- love you, yur such an inspiration! Well, I started school last Monday-teaching Kindergarten that is. I have to say, I am very blessed this year. Last year I had a rough class and God has blessed me with an amazing class of 17 little babies. They are so well behaved and awesome parents too! Glad yall had a great day just relaxing, I love those days when I dont take a shower and lounge around and dont have to get "ready" to go somewhere. Our first day as an 8th grader at Jr. High went great! I cried while dropping my "baby" off at school, but Tanner did great. So thankful for God's provisions!! Glad you enjoyed your "stay home day!" I had to comment on the whole shower situation! I have a 2 1/2 year old and a 15 month old...so it is very very rare that I take a shower before 2:00pm! I only get a chance when both of them finally go to sleep for a nap. I hate to admit that...but I am glad to know that I am not the only one! I have been reading for months and this is my first comment. My son started his first day of Kindergarten today, but unfortunately I couldn't be there since his 2 year old sister is in Children's Hospital for a few days. I too have admired all the pictures of my friends sending their children off to school and just hope that the pictures of my son tuned okay. Of course I cried for not being able to see him off, but he told me all about his exciting day on the phone tonight. I know I will cry harder when his sister goes since she is my last. I have been reading since Harper was in the hospital, but this is my first time commenting. Harper is just adorable and I always look forward to your posts. I sent my daughter off to Kindergarten on Monday. Although I have been sending her to preschol since she was 2-years-old there was something different about sending her to Kindergarten knowing that I don't have as much say about what goes on and I don't get to see the inside of the classroom and talk to the teacher about how she is doing every day. While I didn't think I would shed any tears I did. She did great though and we are now officially in the "real world" of school. First day of Kindergarten I cried liked a baby. My hubby took the day out of work and everyone told him he was a good daddy. He corrected them by saying no, he's a good husband and that he was very concerned about my emotional welfare tha day lol. First day of First grade I still cried a little but then I rejoiced becuase I had missed my quiet morning all summer! You have got to be the most real (is that language correct?) blogger I read. You just show it like it is. I LOVE IT!! Ya'll stayed home today and you didn't show us a bunch of crap, you just shared Harper in her onsie not bottoned, half hanging off her sholder, lovin that paci, having a great day staying at home!!! Thank you for being so real. On the school note, we started 2 weeks ago and my 20 something special education students have settled in quite nicely I suppose. Bailey, on the other hand, has learned to wave bye-bye at daycare in the past two weeks and I cry every time I see her do it. Because I am like you...one day she'll be waving me bye-bye on that first day of HER school. I was disappointed when my husband reminded me early in the summer that Bailey wouldn't be wearing that First Day of School smocked dress and hair bow like I was already planning, but instead, would indeed wear the dreaded SCHOOL UNIFORM!!! UGH!! My oldest started kindergarten last monday. He got up put on his clothes, eat breakfast and he couldn't get out the door fast enough. I had been trying to prepare him for this day,(really I was trying to prepare myself)and when we would talk about his new school I would explain that this was "big boy school" and he had to act like a "big kid". So the morning of his first day I woke him up, he opened his eyes and said "Mommy, is today my first day of big boy school." "Yes,Jack,today you are official a big kid". To which he responds..."Let's see if my legs are longer than they were yesterday!" As he stands up beside the bed, he says " Yep...I am taller, Can't you see,Mommy?" This is something I will NEVER forget! The hardest part of this whole experience has been letting him out of the car infront of the school and he insists on walking in alone. He grabs his backpack and lunch box, jumps out of the car and right before he closes the door, he turns around to say..." Bye Mommy,I love ya!" Oh, how my heart swells with pride! Then I almost get in a fender bender in the school parking lot because as I drive away I'm steadily looking in the rearview mirror as I see him get lost in a crowd of kids! As I drive away I pray outloud...Dear God, he is your child please protect him while I am away from him! And to think...I have to go through this all over again in three years when my 2 year old goes to K5! LORD HELP ME!!!! BTW...Kelly, would you mind telling me when you are going to be in Gulf Shores? I live very close to there!!!! Would LOVE to meet you,Harper,and Scott!!! Our first day went great, but wait until Harper is in 3rd grade. She will politely ask you not to take pictures or hug and smooch all over her as you drop her off. Silly kids...what's so embarassing about a Mom smooching on her kids??!! Well, I have a 2 year old who goes to "school" during the school year b/c I teach 3rd grade. She started this past Monday and it was heart-breaking for Mommy and Daddy...so much so that there wasn't the first picture taken b/c she was wailing the entire time! I was able to stay home with her for her first year, but needed to go back to work (for now, at least). She's in a great place with only about 10 kids total...and there's a new little girl, Abby, just her age. So having Abby there has made this transition much smoother--she is not sad to go to Miss Pattie's each morning (well, for the past 2 anyway! HA!). I've been in a blogging funk ever since we bought our house in May. There's always something to do, which keeps me from blogging as much as I used to. Enjoy every minute of your sweet baby, time flies by!! I LOVE the picture of Harper with her tongue sticking out, it's so cute how you can see the lines on her face from her sleeping..precious! My sweet girl is in there sleeping right now, unaware of how stressed her mom is about her 1st day of 1st grade tomorrow. Kindergarten was only 1/2 day, so I'm sure I'll have a few tears tomorrow as she goes for all day :( Harper is absolutely precious. Houston starts the 24th. Almost here for us! And your mama,(Judy) did too! Wow! God is so amazing! Hey sweetie, I was telling your mom about my daughter Lynnette Kraft from Dancing Barefoot,...How she wrote a book called,.. "In Faithfulness He Afflicted Me". It is the story of God's faithfulness to her when she lost 3 of her 9 children. I know you said that you don't have time to read very much, but her book is so encouraging. I just thought it might be a blessing. Her button is on my sidebar. Thanks again,...I was really touched to get your sweet comment. My daughter is now 11 but her first day of school she did great. She was ready and off she went. For me it was a different story though. I was good till she handed me this note from the teacher to all the parents saying how your kids were bigger and she would take care of them and here was a tea bag to go home and rest. Thankfully I had my sunglasses on because I started to cry she just ran off and went back inline of course. I dont know if she knew how upset, proud just a mess really I was of her. I had to wait till she went into the school too . It was hard for sure and it felt like a long time till I went back to pick her up. Cherish all the years you have because they go by so fast!!!!!! Btw Harper is precious!!!!!!!!! I LOVE to have stay at home, don't get out of pjs, and eat a sandwich type of days every now and then! No "Big School" as Dylan call K5, here yet. He will be five on September 5, but the cut off is September 1. So, one more year of PreK for us. I am A-OK with that though! PreK is only two days a week for a four hours at a time. I in no hurry to send my baby boy off five days a week for the whole day!! Harper looks so much like you in her Face, Kelly! She is absolutely your Mini Me. As for school, I leave for my first year of college tomorrow. My nerves are on overload! Cute pics of Harper! Trust me, treasure these years, because they go by in a heartbeat. My son is heading off to Pre-K in 3 short weeks, and I'm a mess over it! My daughter is 8 now, but still remember that day like yesterday. She went to a wonderful lady for daycare, so she wanted to ride the bush with all those "big kids" she always walked to the bus stop before. Instead of my dreams of taking her to school her first day, I had stand with her at the bus stop (of course with daddy/husband, too) and watched my baby cross the street and get on the bus. We waved until we couldn't see her anymor which is when I broke down bawling like a baby! We then went to her school so we could take pictures of her getting off the bus so I had to pull it together so she didn't see me such a mess! It was sweet watching one of the "big girls" from her daycare help her off the bus and over to the Kindergarten area where I took tons of pictures of her playing and waiting. Once she walked into class, I broke down again and pretty much cried the WHOLE DAY! She loved every minute of it! Every year, I still get a bit choked up on the first day of school. I am lucky now that I get to stay home, so I absolutely LOVE taking her and picking her up everyday. But I was just informed that this year she wants to ride the bus again. Ohhh, here come some more tears....They grow so fast! You could post pictures of Harper with no words every day and I guarentee people would still keep visiting! She's just so darn cute! First day of school hasn't happened here yet, there's 2 weeks of summer holidays left...boo! My daughter will be in in grade 1, and although I'm excited for her, I'm dreading sending my "baby" away for 5 full days a week! You're so right, time does fly by just like that! Thank goodness I still have my little Hudson at home for one more year!!! My little girl started kindergarten and my little boy started preschool. It is very quiet around the house, but they are loving it which makes it a little easier!! Tonight was the first time I'd read your blog, but my mom has read you for months! Then I go to share with my friend that has a 1 month old and she said she had already read! I'm behind the times! Harper is such a pretty thing!! So cute!! While I don't have children, my little sister (and the baby of four kids) starts her senior year of college at CBC in Conway today. I can't believe it! It makes me so sad but also so proud. Thanks for sharing your heart and witness through blogging. My three year old little girl starts preschool in a few weeks. Each morning she awakes and asks if she can go to school today? Days like these make me either want to embrace my blessings and sit back and watch our life grow and change... and then there are days where I want to hurry up and get pregnant because I do not want these times to end.... bittersweet! Harper is just adorable. I know you cherish the time you have with her. The time really does go by so fast. My daughter is starting high school this year and I still cry the first day. She said to me the other day "Mom are you going to cry on my first day of school this year?" We still take her picture outside the front door each year. It is amazing to see how much she has grown! it would be fun to see everyone's "college days," or high school days. who doesn't love to look back on the clothes and hair and laugh! also, you could do one on birth/adoption stories? we started last week. All has went well. My baby- hes 6, started first grade. So I am "alone" for a few hours a day 3 days a week. Amazing what I can get accomplished in those few hours of solitude! I am picking my kids up and taking them to school this year after hearing what is said on the bus by my 13 and 11 year olds-yikes! 2 in elementary school and 2 in middle school. When did I get so old? My daughters first day of 2nd grade was last Thursday. It went GREAT, that kiddo LOVES school and was ready for it to start back up the moment it got out in May. I hope that feeling lasts through the teen years, ha ha! She was dressed in a cute little skirt and top, and did some hilarious posing for her pics (check my blog to see the pics, the girl can work it). Cute pics of Harper today. 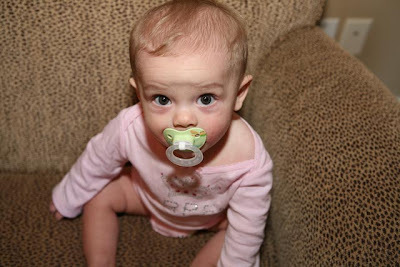 I love that she is lovin' her binky, too cute! 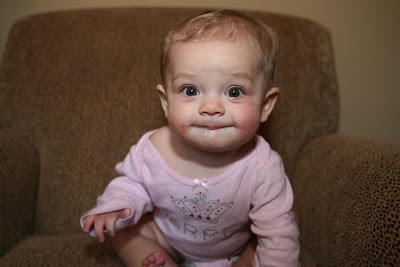 I love when you post pics of Harper, she is a beautiful baby. So since you do, I thought you might want to check out these two sites (I have absolutely nothing to do with these blogs I just love learning from them). These ladies teach you how to use your camera without having to read the manual, it's great! Have fun, you have to perfect subject. My baby is only 10 months but he loves squash and zuccuni. I just wanted to share that with you. harper is seriously just way.to.cute!! First day of school for my oldest? We tried Christian school before we started homeschooling. You know what I did? I went home, cried and baked Talitha's favourite cookies- and it was only a half day- I'm such a sap- I love my kids!!! 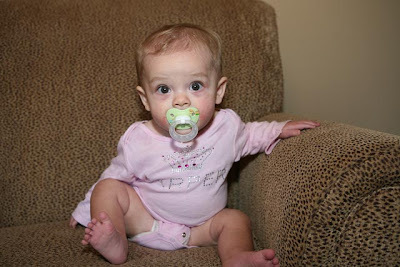 It is SO funny to me that she didn't take a passy until a few weeks ago and she loves it that much!! My three loved theirs too. Before you know it, you will be doing a post on *How in the world do I get this thing away from her*? It's totally worth it though!!! She is adorable! I love that your mom tweets! My son is 21 now, but I vividly rememeber his 1st day...it was devastating. I couldn't imagine that little boy of mine was going to be in someone else's care all day. He seemed so small to be going off on his own. I dropped him off at school and cried like a baby. From then on we celebrated the first day of school every year with a very special breakfast that morning and after school we would go out and buy a special treat for our kids. Let me tell you...it doesn't get any easier after kindergarten! I dropped my son off yesterday for his first day of 2nd grade!! I am already having a hard time this year for some reason...but...he wouldn't let me walk him in! What?! I thought I would die! Independence is good..but, I love it when he needs me...what can I say?! I sent my oldest to kindergarten. She had a staggered week and she went the first day and even rode the school bus home! I took her the first 3 days but on the 3rd day she told me that she didn't need me to walk her all the way to her classroom. I didn't cry the first day until I saw her get off the school bus. It hit me that she was not my baby anymore and she's a big girl. I enjoy reading your blog so much! Harper is a doll! From a fellow "Kelly" -- I'm a new reader to your blog and love it! Your baby is too too precious. My babies are 21 and 25, but still my babies with another first day of school upcoming. Thanks for sharing all your inspiration and beautiful photos!! Oh my word, Harper is just too stinking precious...I could eat her up (unless that is just really weird to hear a stranger say...in that case, just pretend I didn't!!). And don't even get me started on the whole school thing...two of mine start on Monday (at a new school!) and let's just say Mama & Daddy are having a harder time adjusting than the kids are (which is a blessing...I'd rather it be that way!). Anyhoo, thanks for sharing sweet Harper with us! I saw the comment from your mom. TOO cute! When it comes right down to it, that's why I blog too. We had our first official day of school yesterday (we're homeschooling) and so far so good. But it's really just going to be a repeat of last year. One more year until we have to buckle down! My daughter started Kindergarten yesterday! She did great! I was so scared she would cling to my pants leg and not let me leave but she was a big girl. I am happy and sad at the same time because my baby is growing up way to fast--where did the 5 years go and because she did so good! Enjoy each and every day with Harper because it want be long and she will be going to Kindergarten. Harper is so precious! I have pictures up on my blog of our 1st day of school. Have a great day! I love that your mom "tweeted" you! Ha! I don't even know how to tweet! My son started Kindergarten last year. The parents were all sad and all the kids were super excited. Only one was teary eyed but she got over it really quickly. We have been in school for 3 weeks. My oldest started Kindergarten. It was much easier than I thought it would be for all of us. Now, I am counting down the days until preschool starts for the younger one! Harper is the most beautiful baby! Truly, you are so blessed and I think you need to have a t least a couple more, you do good work! Enjoy every second because it passes by in the blink of an eye! That Harper is SO CUTE and I am not just saying that! My oldest started kindergarten last Tuesday and you are right....time goes by so fast. Savor every moment...even the bad ones, because before you know it, they are gone to school! AAHHHH! Do you think saying kindergarten is from the devil is overreacting? Ha ha! Kelly-I just awarded you a blog award!! Go to my page to pick it up! Thanks for being such an honest blogger! My kids are 3 and 18 months and I remember when my 3 year old was Harper's age! It goes by so FAST. He is starting school 2 days a week next month and I am so sad. If I could have it my way the kids would stay home forever! Nothing better than being a Mama (: Although I may change my tune as they hit the teenage years, LOL! Harper is SO cute, you are a great mom! Love the pictures! You'll look back at these pictures and start crying. I watched a video of my baby - who will be one in a few weeks - and started to cry - I miss the baby baby - he's growing up so fast!! She is adorable and I must say, my mother complains about the same thing! When I had my first born my sister in law said to me "the days are long, but the years are short" That is SOOOO true!!!! My oldest will be starting Kindergarten Sept. 8th and even though he'll be six a couple weeks after he starts, I'm still not quite ready for my "baby" to be gone at school! So strange- while I was waiting for your blog to load, I was actually thinking, " I wonder how Kelly comes up with all her blog ideas." How funny! Harper is a doll- love the pictures! My oldest started Kindergarten and I posted twice about it yesterday. LOL It went great and is excited to go back tomorrow (half went yesterday and half today, so he didn't go today). On the previous post - I totally agree! Over and over I've had people call my yongest a girl. Even dressed from head to toe in blue, they still call him a girl. I don't get it. I just love the photos. The one of her sticking her tongue out is priceless! She is a doll. We homeschool here so no first day jitters or tears going off to school. I could not imagine putting my kids on a bus or leaving them all day. I did it with my first son, but not with my last two. It was always hard to see my first son leave and be gone all day.